Get ready to be blown away (literally) by this spicy Singaporean curry. 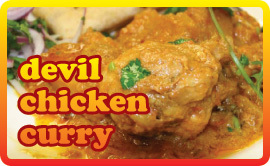 It’s full of heat and flavour and is up there with the hottest Indian curries. It’s more fragrant than the likes of Indian vindaloo but it packs as much punch. It’s one of the best curries I’ve tasted so if you’re up for it have a go. Don’t hold back on the heat though, live a little. In a food processor or with a hand blender. Blend till very smooth the fresh and dried chillies, onion, garlic, ginger and lemon grass. Season the chicken with a little of the salt and some pepper. Heat the oil in a wok until just hot. Add the paste mix and fry over a moderate heat for 3-4 minutes adding a little of the diluted coconut milk during this time until the oil separates slightly. Now add the mustard powder, sugar, vinegar and salt and then the remaining diluted coconut milk. Bring this to the boil then add the chicken pieces. Once this begins to boil again, reduce the heat to low and cover. Gently simmer the chicken for 10 minutes, then add the remaining coconut milk and 1 cup of water. Simmer uncovered for 40 minutes stirring occasionally. The oil will separate so if you’re feeling a bit nervous about how this looks then you can skim a little off before you eat it, or just pretend it’s not there by stirring it in. Plain boiled rice. I also sprinkled over a good handful of chopped spring onions, some chopped peanuts and a couple of thin slices of tomato. Superb!